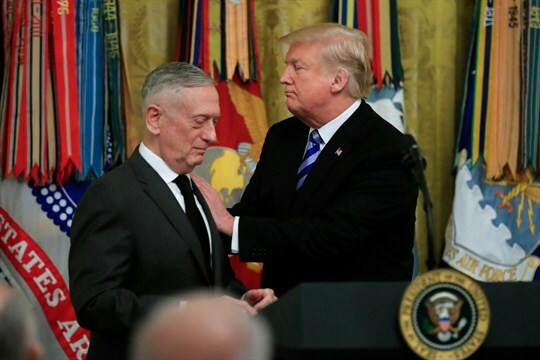 U.S. President Donald Trump and James Mattis, then the secretary of defense, during a reception in the East Room at the White House, Washington, Oct. 25, 2018 (AP photo by Manuel Balce Ceneta). During the Cold War, America’s global strategy was based on two pillars: leadership and security partnerships. First applied only to Europe, this strategy later expanded to the Pacific and, by the 1970s, to the Middle East, which became and remain the most important regions in American foreign policy. Global leadership placed economic and military burdens on the United States, but most Americans believed that the benefits justified the costs. While there were always debates over precisely how and where to implement the strategy, there was broad agreement on the two core pillars. The political right and left, Republicans and Democrats, felt that leadership and partnership best promoted U.S. national interests.